A must in Feng Shui decorations, a delight in modern interior designs. Makes your garden or patio feel like a natural paradise. Comes with LED lights that illuminates the water at night. Simple installation procedure, no special tools required for assembly. Inside is 10-feet cable (2 meters). A tower that opens to a wealth of creative ideas, a solace of peace and comfort and an unimaginable comfort that only nature can bring. 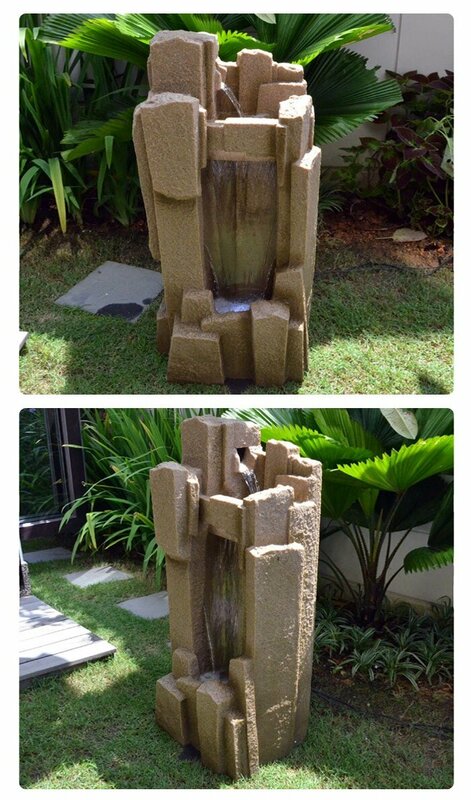 This water fountain piece is 39” high and is undoubtedly meant to be a center piece in your home, place of work or garden, it is meant to attract attention and to set the cool and calming tone of the place where it is located. It will tower above everything else but, more importantly, the sound of water flowing and falling will give an unprecedented sense of peace and tranquility that only a fountain this size will give. The size and the abundance of water are what make this piece a favorite of Feng Shui master. Water has long been believed to be a source of abundance in Feng Shui. Scientifically, water is the fountain of life. Artistically, water is the most soothing element that may be added to any kind of design theme. The presence of this fountain in your home, garden, store or office will bring positive energy and an aura of productivity. This water fountain is a majestic fountain in every sense of the word. If you have a big place or are going for grandness and luxury without being intimidating and maintaining the homey and natural feel, this is for you.